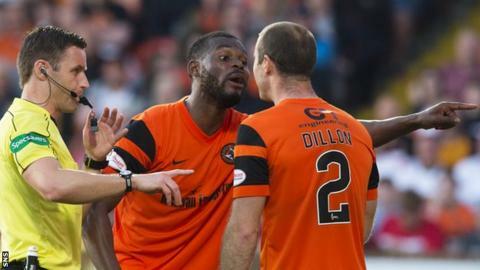 Wato Kuate will not play for Dundee United again after a heated exchange with team-mates against Hamilton Academical, says manager Ray McKinnon. The 21-year-old argued with Mark Durnan and Sean Dillon before being substituted during the 0-0 Premiership play-off final first-leg draw. He then gestured towards home fans as he was jeered from the pitch. Asked if Kuate had played his last game for the club, McKinnon told BBC Scotland: "Absolutely." Cameroon-born Kuate, who spent two years in Manchester City's youth academy, was playing his eighth game since signing for United in March. Asked if he had spoken to the midfielder after replacing him with Charlie Telfer after 57 minutes, McKinnon said: "I haven't said anything. "My focus is on my players and my good group of players in there who are all united together and they're all desperate to win games." Kuate, who scored in the second leg of United's play-off quarter-final win over Greenock Morton, was having a poor game when Durnan criticised his latest moment of slack play. "Mark was telling him to buck up his ideas and I don't think Wato took kindly to that and, being a bit of a hothead, his reaction was very poor," explained McKinnon. "To walk off the park and show that disrespect to his team-mates and his fans, it's not tolerated at Dundee United." McKinnon said he had "no idea" whether Kuate was still in the stadium. After leaving Manchester City, Kuate made seven appearances for Akhisar Belediyespor in the Turkish top flight before leaving for Asteras Tripoli. He did not make an appearance for the Greek Super League club but played four times on loan to Trikala in the third tier before joining United. The Tangerines, hoping to win promotion to the Premiership after finishing third in the second tier, travel to New Douglas Park for the second leg of the final on Sunday.